G&B specialises in the mechanical design and production of GA & fabrication CAD drawings of pressure vessels, storage tanks, heat exchangers and stacks design, in the following industries: Petrochemical (offshore and onshore), chemical, power generation, nuclear, pharmaceutical, food, refrigeration, heating and ventilation, etc. 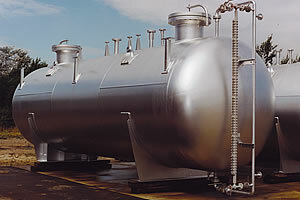 Pressure Vessels: ASME VIII DIV. I & II, PD 5500, EN 13445 & Pressure Equipment Directive (PED). Shell & Tubes Heat Exchangers: TEMA, ASME VIII DIV I, PD 5500 & PED. Air Cooled Heat Exchangers (Fin-Fan): API 661 (including header boxes design). Storage Tanks: API 650, API 620, BS EN 14015 and Rectangular Tanks to GEP. Stacks (Chimneys): BS 4076 and GEP. The above also under the requirements of DnV and Lloyds. Specialised Calculations: fatigue assessment, thermal/mechanical stress calculations, wind loads & vibrations, seismic loads, liquid sloshing effects, effect of piping external loads on nozzles/shells, secondary & discontinuity stresses, creep and creep-fatigue effect calculations and any associated Finite Element Analysis (FEA). Calculations are performed using the best available industry software and in-house spreadsheets/MathCad. FEA software: see the FEA section in this Engineering section.